Constructed at the Yale factory in Manie, this Eye&Eye tail is great for both climbing and hip prussic applications. Yalex is a 100 percent high tenacity polyester 12 strand single braid. Yalex is a great all-around rope which enjoys a multitude of Arborists uses such as pruner cords, adjustable slings and spider legs to name a few. This rope supplies the toughness of tree grade Maxijacket coatings which can supply up to 8 times the abrasion resistance of uncoated rope. 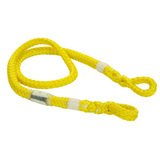 The rope is a snap to splice, has a great strength to weight ratio, and low stretch. Yalex is a two end per carrier construction, which is more expensive to produce but creates a larger hole in the middle of the rope making new and used rope splicing easier.